Vakili-Basir, A., Gholami-Fesharaki, M., rozati, M., maghroori, R. (2019). The Effect of Personal and Occupational Risk Position on Musculoskeletal Disorders. Rheumatology Research, (), -. Ahmad Vakili-Basir; Mohammad Gholami-Fesharaki; Mohsen rozati; Razieh maghroori. "The Effect of Personal and Occupational Risk Position on Musculoskeletal Disorders". 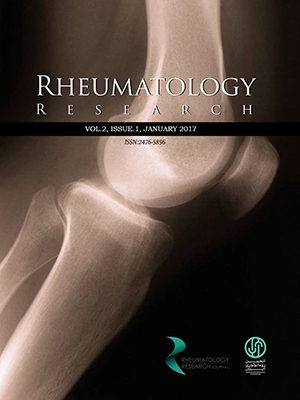 Rheumatology Research, , , 2019, -. Vakili-Basir, A., Gholami-Fesharaki, M., rozati, M., maghroori, R. (2019). 'The Effect of Personal and Occupational Risk Position on Musculoskeletal Disorders', Rheumatology Research, (), pp. -. Vakili-Basir, A., Gholami-Fesharaki, M., rozati, M., maghroori, R. The Effect of Personal and Occupational Risk Position on Musculoskeletal Disorders. Rheumatology Research, 2019; (): -. Musculoskeletal Disorders are among the most important health risks in various organizations, especially in heavy industries. So, the purpose of this study was to determine the effect of personal and occupational risk position on musculoskeletal disorders. This cross-sectional study was carried out from April 2015 to May 2016 in Esfahan’s Mobarakeh Steel Company using a stratified random sampling method. In this study, occupational risk duties such as heavy lifting, carrying load, long sitting, stand and move, in addition, personal unsafe behaviors like risky actions involving waist, shoulder/arm, wrist, neck, knee, elbow, ankle, and chamber are considered as independent variables while musculoskeletal disorders (evaluated by NMQ) were considered as dependent variables. The study sample included 300 male workers (with the mean age of 41.01±8.17 years and mean work experience of 16.00±7.66 years). The results showed a positive relationship between shoulder injury risk score and shoulder/arm (OR=2.42, CI= (1.25-4.71)) and knee (OR=2.39, CI= (1.08-5.28)) disorders. Our findings also showed such positive relationship between upper back risk score and wrists/hands disorders (OR=2.41, CI= (1.01-5.76)), lower back risk scores and waist (OR=2.49, CI= (1.39-4.45)), shoulder/ arm (OR=1.63, CI= (1.04-2.57)), and neck (OR=1.85, CI= (0.98-3.49)) disorders. Based on the results, more consideration must be paid to personal and occupational risks and it is highly suggested to make convenient modifications in work environments in order to decrease musculoskeletal disorders in workers of the steel company.